Chances are that if you are a regular Asphalt & Rubber reader, that means you are a pretty tech savvy person. So first of all, congratulations on your choice to get your motorcycle news and opinions in digital form, rather than waiting three months for the print guys to get their act together. Huzzah! Of course, this also means that you have had to suffer through the endless onslaught of “Top 5” lists that have inundated motorcycle “journalism” the past year or so. I’m pretty sure that in a few years, we will look back at the whole BuzzFeedification of news as the second worst idea to hit motorcycle journalism, right behind the idea of a content paywall — but I digress. That being said, I did want to share with our A&R readers five apps that I use on my iPhone everyday, that maybe you haven’t stumbled upon. So in the interest of better living through technology and all that jazz, I’ve created my own little Top 5 list — Yes, I’ve died a little bit on the inside because of this article. Hopefully though there are couple apps on my list that you haven’t heard of, which will cause the overlap of your Venn diagram of “motorcycles” and “technology” to grow just a little bit more, and those make my personal ethical sacrifice worthwhile. I realize in advance that this list leans towards iOS users. I’m hoping commenters will leave a few apps in the comments section that I might have missed (especially on other platforms), so we can spread the love around. First up is Waze (pronounced “ways”), a social map app. You might think that Google and Apple’s offerings get the job done just fine (and for the most part they do), but Waze incorporates some social network features that cater pretty well to the two-wheeled lifestyle. 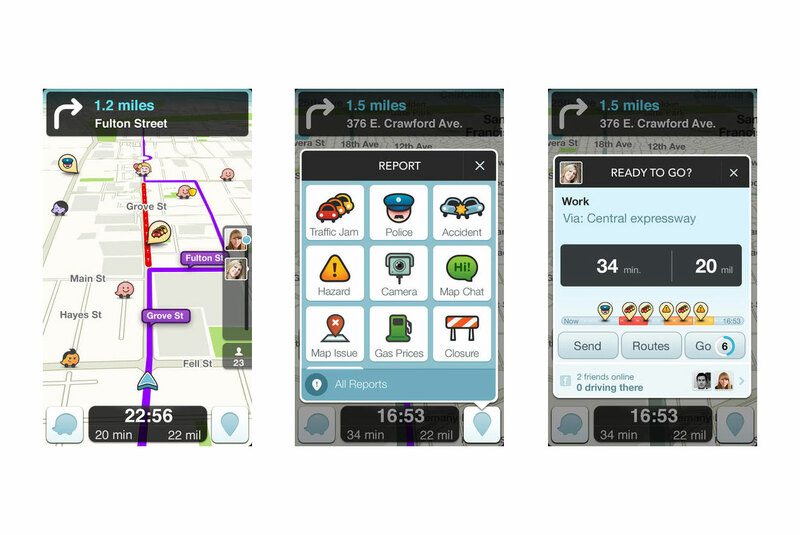 Beyond allowing users to flag cheap gas prices, speed traps, and traffic slowdowns in real-time, Waze has a clever feature where you can send your route to a friend, who then can track your progress. As someone who riders without a bluetooth headset in his helmet, this is a great remedy for that “call when you get close” situation. You can keep your phone in your pocket while you ride, and your destination can check on your progress via a web browser. Powerusers will enjoy this feature for group rides, as you can quickly share a ride’s route publicly, and then use the “Share ETA” links to keep tabs on each other if you get separated. When a friend recommended Dark Sky to me, I was skeptical. As nice as the UI was, did I really need another weather app? You’re probably asking yourself the same thing. But there have been a few times when Dark Sky has saved me and my motorcycle a cold ride home in the rain, and if you forgot to pack your Gortex that day, $4 is a small price to pay for dryness. 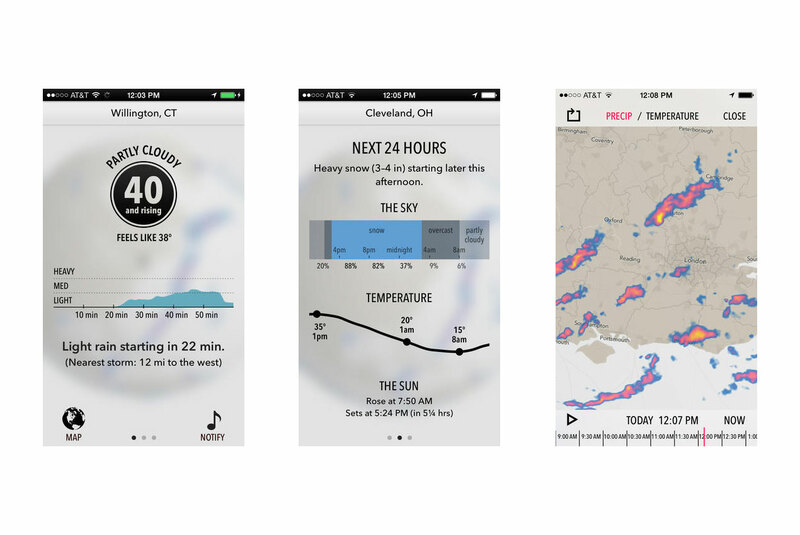 Dark Sky’s power comes from its ability to show you the future weather, at your exact location, in a beautiful interface. You can setup alerts for rain and snow, and beyond a dopplar radar map, Dark Sky makes it easy to see when the cold and wet stuff will be falling from to terra firma at your location. In my use, I’ve found it more accurate than anything else out there, though that’s not to say it’s been spot-on perfect. What would really get my motor running would be the ability to integrate a route into its weather database, so one could know when on a ride (and where), the weather was going to hit. The big downside is this app is Apple only. Sorry Android users. I have a love/hate relationship with forums. They are absolutely a great place to gain knowledge and ask questions on a particular model of motorcycle (you own a 2001 Suzuki TL1000R you say? ), they are also great for organizing local riding communities (you live in the SF Bay Area you say? ), but one should always beware the forum trolls and post count egos. That being said, for the forum junkies out there, TapaTalk is a must. I keep this app on my phone for the simple reason that when I’m elbow-deep working on a bike, and have a question, I can search the forums, make posts, and read responses, all from my pocket. For forum powerusers, who waste hours a day on the boards (you know who you are), TapaTalk is just the easiest way to keep up-t0-date. The one caveat is that a forum needs to have the TapaTalk software installed in order for the app to work, which means you’ll have to talk your forum admin into installing it, if he or she hasn’t already. A fairly well-adopted app in the forum space (it hooks into vBulletin very easily), it shouldn’t be too tough of a pitch to make. 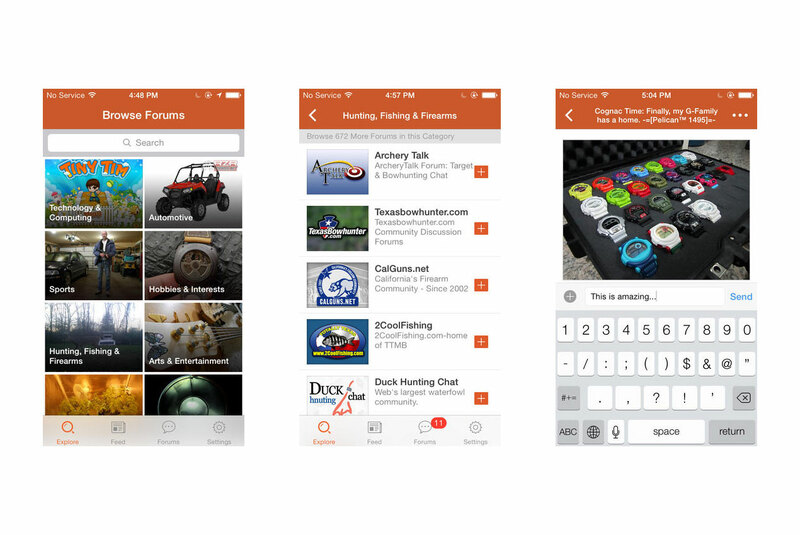 Unless your forum goes with a branded app, TapaTalk is free to everyone involved. Booyah! I don’t quite “get” the whole model behind Eat, Sleep, Ride. The Canadian team behind the social network website have some work to do on their web property, if I’m being honest; but their iPhone app is probably one of the best I have ever seen. The Canadian government helped fund its development, and it shows. 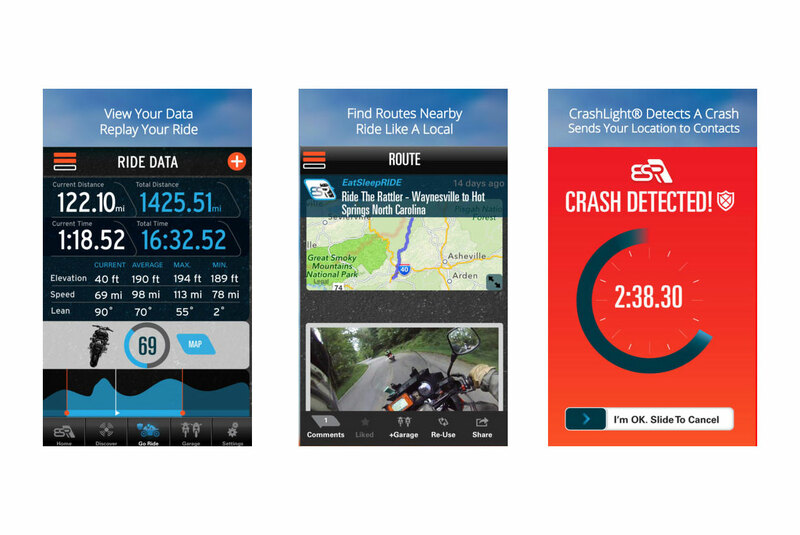 Besides letting you interface with your ESR account, it has powerful features like route discovery, ride recording, and crash notification — wrapped up in a professional looking package. Because it’s socially driven, the route discovery is a bit hit or miss…you’re really only as good here as the people using your service, and when I compare the results in San Francisco to “The Greatest Road” (our next app), I’m left wanting. The ride recording mode is pretty fun though, for those of you who are metrically driven, but the real power comes from the CrashLight™ feature. Another product of ESR‘s government funding, for $7.99/year CrashLight will alert three designated contacts in the event you crash your motorcycle. The app uses your iPhone’s movement measurements, and when it detects that you’ve hit the tarmac, it give you a three-minute timer to cancel CrashLight email/texting/phone call to your designated parties, complete with GPS co-ordinates. It’s a pretty nominal fee, for when you consider the safety potential being offered here by CrashLight, and easily makes the overall cost of the ESR app worthwhile. Truly a brilliant idea, I can think of a couple riding buddies who could have benefited from this app already, though I have yet to actually test it myself in the wild yet (knock on wood). I do believe the ESR team will expand this app into other mobile platforms, so hang tight Android and Windows users. 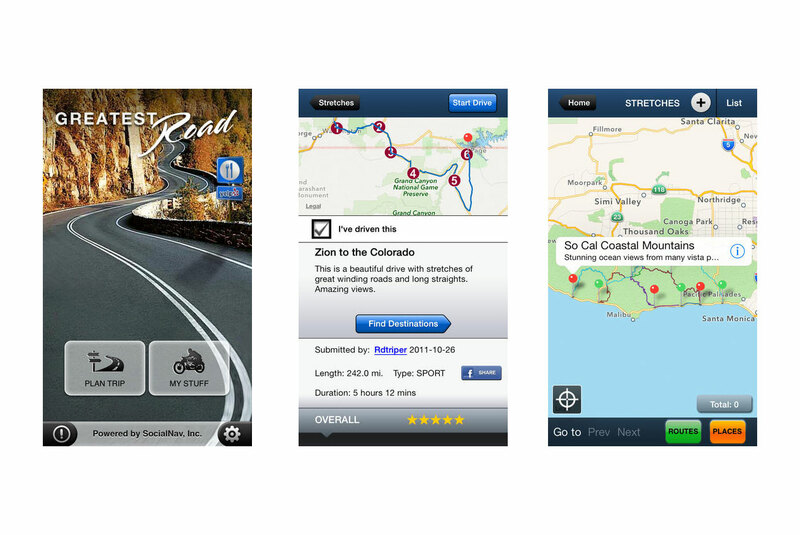 We have actually mentioned The Greatest Road app before on Asphalt & Rubber, and while the iPhone-optimized app hasn’t changed much, it remains as one of the best ways to discover local rides and routes. As I said above, I prefer The Greatest Road over Eat, Sleep, Ride for social route discovery, the userbase has just done a better job of mapping rides in my area. It probably helps that The Greatest Road team is here in San Francisco, but we used this app a bit during our “Broventure” trip to Moab, Utah. It could still stand to have some curation, and you will find the occasional newb who has made his route to the grocery store on here, but The Greatest Road is good for that 95% overview of an area. Don’t expected The Greatest Road to out Butler Maps out of business anytime soon, but until that paper and DVD selling business model gets with the 21st century, this is as good as it gets. Did we miss listing an app? Or do you have an alternative app for another platform? Let us know in the comments!